Our Burlington County employment lawyers represent employees in all areas of employment law throughout the state of New Jersey. The Burlington County discrimination lawyers of Smith Eibeler represent residents and individuals who work in Burlington County in claims of Sexual Harassment, equal pay violations, wrongful termination, Disability Discrimination, reasonable accommodation, pregnancy discrimination, severance agreements, Unemployment Appeals and non-competition litigation. Our law firm is located in Monmouth County at the Bell Works building in Holmdel, New Jersey. Burlington County is located in central New Jersey and is bordered by Mercer, Monmouth, Ocean, Atlantic, and Camden counties. Burlington County stretches from Chesterfield in the north, Evesham to the west, Woodland Township to the east, and Bass River Township to the south. The county borders Pennsylvania in the west. Burlington County has a total area of 819.84 square miles, which includes 21.26 square miles of water. Henry Hudson first discovered the land that became Burlington County in 1609, and the county was later founded in 1694. According to the 2010 Census, the total population of Burlington County is 448,734 people, which is comprised of 166,318 households and 117,254 families. The median age of Burlington County residents is 40.4 years old, and in 2000, the median income of Burlington County households was $58,608. According to Choose New Jersey, the largest ten employers in Burlington County include Lockheed Martin, TD Bank, Virtua Memorial Hospital, Burlington Coat Factory, PHH Corporation, CVS Caremark Distribution, Automotive Resources International, Viking Yacht Co., Deborah Heart and Lung Center, and Shoprite. Burlington County is home to several museums and historic sites. This includes the Historic Prison Museum, Smithville Mansion Annex Gallery, the Underground Railroad Museum, and the Warden’s House Gallery. Several wineries are located in Burlington County, such as DeMastro Vineyards, Iron Plow Vineyards, and Valenzano Winery. Burlington County maintains 13 public outdoor recreation areas and parks. This includes the Rancocas State Park, Laurel Run Park, Amico Island Park, Boundary Creek Natural Resource Area, Pennington Park, and Long Bridge Park. The Bass River, Delaware River, and the Wading River all flow through the county. There are both public schools and private schools located in Burlington County. A few of the best public high schools include Moorestown High School, Lenape High School, Cherokee High School, Rancocas Valley Regional High School, and Shawnee High School. The county also contains private schools such as Moorestown Friends School, Doane Academy, Holy Cross Academy, and the Life Center Academy. There are also institutions of higher education in the county, including Rowan College at Burlington County. Famous persons who live or have lived in Burlington County include Shawn Andrews, Sheldon Brown, Brit Morgan, Christina Foggie, and Alice Paul. Restaurants in the area include Fratelli’s Italian Restaurant, Casamari, Kitchen87, Curtin’s Wharf Restaurant, and Blue Claw. 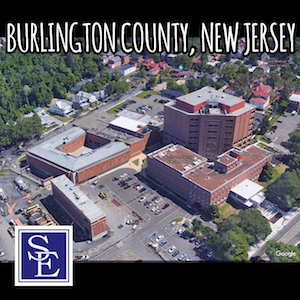 The Superior Court for Burlington County is located at 49 Rancocas Road, Mt. Holly, New Jersey. Our New Jersey employment lawyers can file a lawsuit and have it properly venued in Burlington County if one of the parties lives in Burlington County or if the employer regularly conducts business within Burlington County. Should you or a family member have an employment related legal issue and are in need of a Burlington County employment lawyer, please call our office today to discuss the facts and circumstances of your employment related legal issue.